One of my favorite things to do is fabric hunt. I love to go look for a new print or something fun that will jump off of the shelf and say- pick me! I typically never have a problem with that, but occasionally I am on the hunt for something very specific. I need just the right red, or this color- but in a different value. I hunt, stare, track- nothing! It doesn’t exist in my world. What to do?! Dye your fabric. gasp. What?! I have not ventured out in the color world of dyeing. I have mostly stuck to the color brown. Yeah. 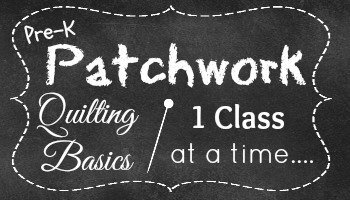 Not so pretty, however, it can change the whole look of your fabric and the mood of your finished quilt. My favorite color is blue– but in the last little bit, I have been drawn to red….. hmmmm. I digress. Finding the right color combinations is a struggle for me, and now I have to figure in the mood?! I think that is why I love to sew with a collection of fabric. It has been designed all together- they match, I am attracted to the colors and the mood or how it makes me feel. Do you pick your fabric by how it makes you feel? How about these three- not only does the color combinations change our reactions and emotions, but so does the fabric print. The first and last have homespuns which give it kind of a warm and snuggly look, where the center one is so bright and cherry! 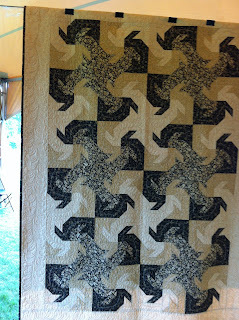 If you’d like a tutorial on how you can dye or antique your whole quilt top- clickety click here. 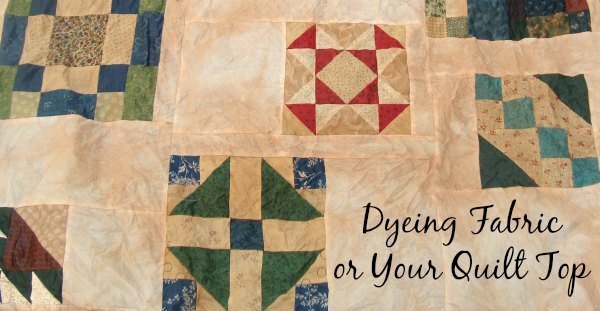 If you are into exploring different colors in your dye- in color order has a wonderful fabric dye tutorial. 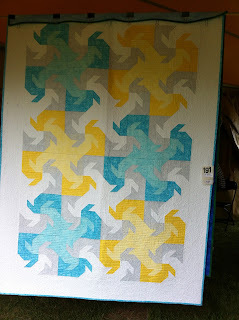 What is it about color and quilts for you? What color do you prefer using and why?